In this ground breaking book, Newton Hightower explains how he was once a rageaholic, tried meditation, pillow-pounding and other methods to release his anger to no avail. He kept thinking he could gain control and change his behavior. Through his own experience with rage, and the consequences of being fired and becoming depressed, he developed this revolutionary way to recover from anger. And now he shares his methods with you to free you from the chains of rage and destruction. Anger Busting 101 was awarded the Benjamin Franklin Award for Best Psychology/Self Help book for 2002 by the Independent Book Publishers Association. The award is given to top books produced by independent publishing companies throughout the United States and Canada. Anger Busting 101 also received the Silver Medal from ForeWord Magazine’s Book of the Year Award for 2002 Psychology/Self Help books. Prominent librarians and bookstore owners evaluated new books for significant contribution to the library/bookstore field from over 1,000 entries. Get your copy of Anger Busting 101 today! 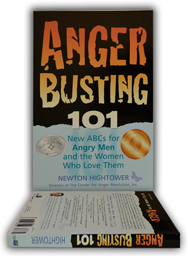 To order your copy of Newton Hightower’s book, “Anger Busting 101: New ABCs for Angry Men and the Women Who Love Them” click the Order Now button below.